Direct Bus: There are 3 direct bus services from Kanchanaburi to Chiang Mai which you book online. Train: travel by road to Ayutthaya and from there take a bus to Chiang Mai. This service is operated by the Sasanan Transport Company and their bus services run every day of the year. The journey by bus from Kanchanaburi to Chiang Mai with the Sasanan Transport Company is scheduled to take 12 hours 00 minutes. All bus services have an on board toilet and a snack is included in the price. The difference between the Express bus and the VIP bus is the amount of legroom you get. There 46 seats on the Express bus and 30 seats on the VIP bus. You can buy bus and minivan tickets at Kanchanaburi bus station for the journey to Ayutthaya. There is no need to book tickets for the journey from Kanchanaburi to Ayutthaya in advance as there is always plenty of room on board these cheap basic bus services. It is, however, advisable to book train tickets from Ayutthaya to Chiang Mai as this is a busy route and 2nd Class A/C Sleeper Berths and Seat often book out in advance of the day travel. To buy train tickets from Ayutthaya to Chaing Mai use the drop list to change the starting point of the journey in the Search Box above to ‘Ayutthaya’ and click to Find Tickets. Travel by train from Kanchanaburi to Chiang Mai is a three stage journey. Public bus services run throughout the day from Kanchanaburi’s main station (see below for a location map) to Saphanburi. This bus journey takes around 2 hours 30 minutes and costs 60 THB per person. Pay the ticket collector on the bus. See more information about travel Kanchanaburi to Ayutthaya. The bus from Kanchanaburi terminates at Saphanburi bus station. From Saphanburi you need to take a minivan to Ayutthaya. Minivan services leave frequently when they are full. The journey by minivan from Saphanburi to Ayutthaya takes 1 hour 15 minutes and costs 70 THB per person which you pay as you board the minivan. See more information about train travel from Ayutthaya to Chiang Mai. Bus services to Chiang Mai depart from Kanchanaburi’s main bus station on the U-Thong Soi 6 Road. Direct bus services from Kanchanaburi terminate at Chiang Mai Bus Terminal 3. Chiang Mai Bus Terminal 3 is 3.4 km from the Thae Pae Gate in Chiang Mai’s Old Town. By shared taxi or tuk-tuk the journey from the bus station to Old Town should cost around 60 THB. There plenty of things to see in Chiang Mai but there are also plenty on places you can travel onto from Chiang Mai which is a transport hub for Northern Thailand. Pai, which is a town in the mountains about 4 hours from Chiang Mai by minivan. Chiang Rai, which is a beautiful town with great temples around 3 hours 30 minutes by bus to the North East of Chiang Mai not far from the Northern border with Myanmar. 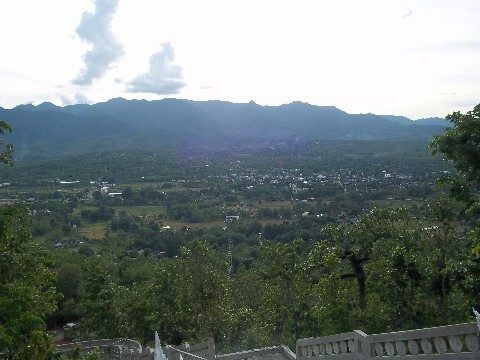 Loei, which is a city to the South East of Chiang Mai surrounded by mountain ranges the most popular of which with visitors is the Phu Kradueng National Park. The journey by bus from Chiang Mai to Loei takes just over 9 hours. Nong Khai, which is border town close to Vientiane, the capital of Laos. You can travel there direct by bus from Chiang Mai to Nong Khai in about 12 hours, or you can fly from Chiang Mai to nearby Udon thani and from there take a train to Nong Khai. The journey by train from Udon Thani to Nong Khai is scheduled to take between 35 and 47 minutes.